On my final night in London, I knew I wanted to lay low and have a low-key night after nonstop sightseeing for a full week. With an late afternoon flight back home to DC the next day, I wanted to use the evening to pack and get situated to make sure my travel to London Heathrow Airport went as smoothly and stress-free as possible. 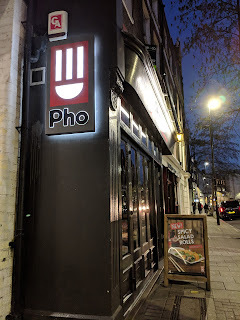 In looking for soothing, safe places to eat out for my final dinner, I quickly zeroed in on Pho, a UK chain serving up Vietnamese street food and soups where "practically everything" is gluten-free. With a menu not only filled with options, but also reviewed and certified by Coeliac UK, I was sold that this was the perfect place to get a cozy, comfort food meal before a busy day of travel. The location nearest to my Holborn hotel was in Clerkenwell, which also happens to be the chain's first location. Arriving for an early dinner, I was excited to settle in and enjoy a big bowl of broth and noodles. As I mentioned, Pho prides itself on being rather gluten-free friendly, with almost everything on the menu safe. That being said, the only gluten-containing items that are off limits are the spring rolls, nem hai san, hoisin sauce, and beers. Other than that, everything is good to go. Those looking for vegan options should know that they also have a guide to dishes that fit that diet also on their website. Although I knew I wanted a bowl of noodles and broth for my main course, I waffled over my choices, with so many tempting dishes to choose from. As I debated, my server recommended that I start with summer rolls, which I happily agreed, selecting prawn as my protein (which I learned are not the same thing as shrimp; they're two different crustaceans!). The summer rolls are perfectly portioned for one to two diners to enjoy. I loved the textural contract of the noodles, crunchy herbs and veggies, plump prawns, and sticky rice paper. 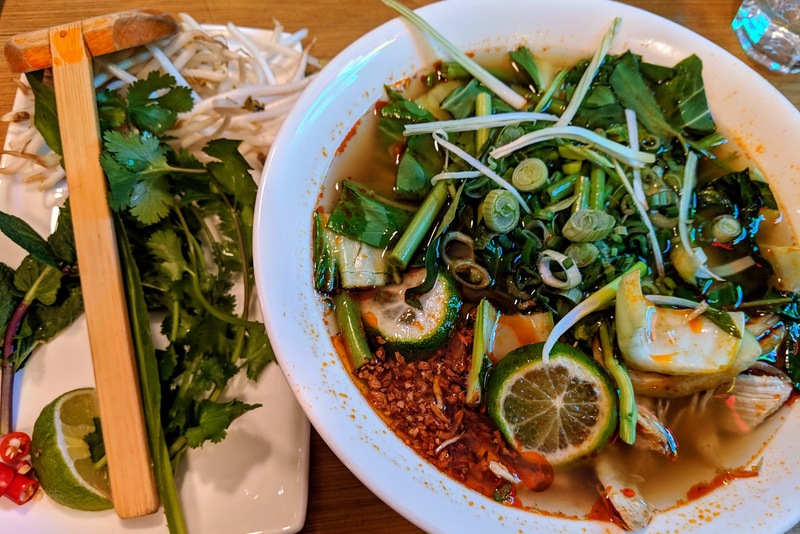 The flavors are really leant from the herbs and prawn, and dunked in Pho's peanut sauce, the combination is sweet, savory, and bursting with flavor. I've definitely experienced my fair share of flavorless, underwhelming summer rolls, so was relieved to discover that these are the polar opposite. 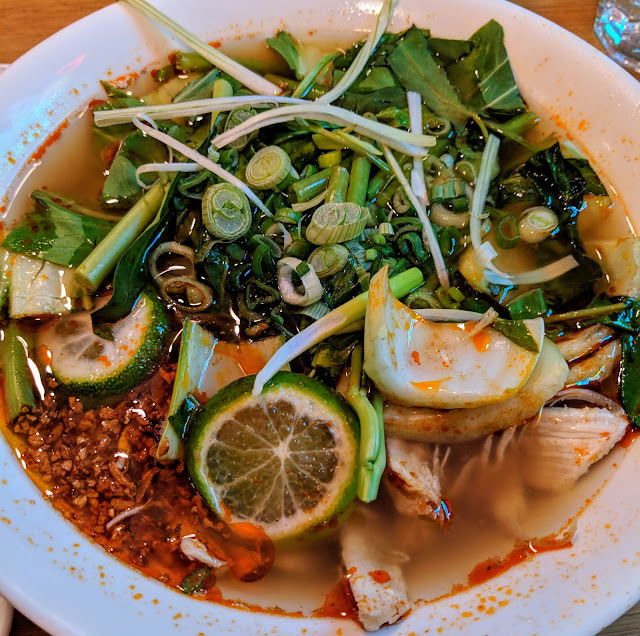 For my main noodle bowl, I selected one of their house specials: the spicy green, which comes with chicken, morning glory, pak choi, green beans, lime, and thai basil all in a vegetable broth. I really liked how Pho didn't skip on fillings, and instead packed the bowl with a generous amount of veggies, meat, and noodles. As with the summer rolls, the spicy green's flavor was tent poled by the fresh herbs, in addition to chili seasoning and lime juice to add spicy and tart flavor notes respectively. The chicken was tender and the noodles were perfectly cooked. As with any pho-type dish it was not glamorous eating the soup, but well worth it as it indeed ticked every box of what I was looking for in a low-key comfort food kind of dinner. My only less-than-glowing comment is that I think I would have preferred a chicken broth for extra depth of flavor, but that is only a minor quibble. This soup definitely ranks among the top tier of noodle bowls I have enjoyed. There is absolutely nothing better than a big bowl of noodles and broth on a February evening, and I am happy to report that Pho definitely earned my seal of approval on the night I visited. I left full, warm, and happy, which is exactly how I wanted to feel on my final night in the city. Kudos to Pho for being so special diet friendly, especially their staff who made sure I was taken care of. With locations throughout England, I'm sure I'll be back soon on future travels in search of some seriously good eats!